How to fix motorcycle starter One component on a motorcycle that also has a vital enough role is a starter. If your motorcycle is equipped with a kick starter, if the starter dies may not be a problem. Because you can still turn on a motorcycle by use a kick starter. However, some motorcycles today are not equipped with a kick starter. So what if the motorcycle starter dies? the only way is by being pushed. This would be very inconvenient. To improve the motorcycle starter, of course you must know the early symptoms of damage to the motorcycle starter. Check for early symptoms of motor starter death like a rough voice, or even no sound at all when the starter button on tap. If when the starter button is pressed but the starter does not spin alias just silent then most likely caused by a motorcycle battery is weak. Damage to the motor starter can occur in four components namely battery or battery, circuit, starter relay, and motorcycle starter itself. For how to check the review below. Battery is a very important component in a motorcycle, because this component as a source of electric current motor one for the starter system. If the starter button is pressed but the starter motor or the starter dynamo alias does not want to spin then the first time that must be checked is the source of the battery. Use a multimeter or avo meter and check the battery voltage. Good battery voltage is not less than 12 volts. If it is less then there are two possibilities ie the charging system is problematic or indeed the battery is damaged. If it turns out the battery voltage is still good then the next step is to check the rangkaianya. Check starter circuits ranging from broken cables, sockets or dirty starter buttons. How to use multimeter, check whether the current flowing or not. If there is a broken cable should be replaced a new one or if forced you can reconnect, if the dirty starter button clean with fine sandpaper. This one component serves as an electromagnetic switch to break and connect a high enough electrical current from the battery to the starter motor. How to check it, connect two wires (usually there socketnya) to the battery (+ and -), if the sound sound "print" means still good. If not most likely the bendik is dead and how to fix it is with a new blue throwing alias. Damage to the starter motorcycle is rare. Check by using multimeter by means of probe (+) connected with cable to starter motor and probe (-) connected with mass. Press the starter button and check if there is an electric current flowing or not. If there is, then certainly the starter motor is off. Damage to this starter motor there are two possibilities ie brush (brush) is worn out or the coil break. If only the brush is worn out, you can replace it with a new one, but if it turns the spools (spull) break it should be brought to the serviceman dynamo.That's how to fix a motor starter you can do at home. 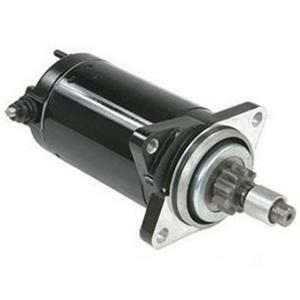 Well for a durable motorcycle starter should do maintenance of motor starters on a regular basis.